I was pretending to be sad in this picture. Now I’m not pretending. Yesterday, the “you, too” side won the argument. Bad times have arrived. Because other unfortunates were ahead of me in line for the photos, that meant an agonizing hour in the waiting room where, surrealistically, the television was blaring a Donald Trump speech. Finally, it was my turn with the camera specialist, who asked me what I do for a living. I stammered, ” I’m a happiness teacher,” thinking, “please, please don’t talk to me about happiness because now all I am is a terrified person.” Fortunately, there were no more questions; he instead reminisced about a recent trip to Costa Rica. Ironically, when I left the dark camera room for the sunlit hall on my way back to the examination room, everything was startlingly rose-colored. Seriously — the dye that had been injected in my hand in order to get better eye pictures temporarily turned my vision deep pink. It was brief, beautiful, and definitely not metaphorical. Finally, the diagnosis: retinal neurovascularization in my left eye, bleeding that has already caused permanent damage to my eyesight and would blind me completely in that eye — probably within months, the doctor said — if left untreated. Fortunately, there is a treatment, a drug that will be injected right into my eye. The doctor assures me, this will hurt. I need to have the treatment a minimum of three times, probably six times, maybe more, starting right away. Since it was Friday afternoon, and these injections are a two-day affair, the first treatment is scheduled for Monday afternoon. But I’m not writing this because I feel sorry for myself. I don’t, actually. This is the kind of suffering that visits each of us multiple times throughout our lives. Perhaps literally millions of people are suffering much worse physical and emotional pain than I am at this very minute. Bad times take many different forms. Who knew it would be vitreous hemorrhage for me? I never even heard of vitreous hemorrhage before Friday. The reason I’m writing today is to reflect on just how a happiness professional should handle this situation. I believe the answer lies in embracing unhappiness. I managed to beat back the tears until I left the doctor’s office. I don’t know why. Surely the doctor and his staff see many people cry, and I definitely wanted to cry. My left eye is irreversibly damaged. I almost lost my vision completely in that eye. That is worth grieving over. That is worth many tears. I know I’ll be done crying soon. From both personal experience and research on happiness and resiliency, I know I’ll bounce back and be my cheery self again, presumably with a keener appreciation of my eyesight. For now, though, it’s important to face this reality, not sugar coat it. There’s a lot to be grateful for in this situation, and I’ll get there. However, a full and rich life demands feeling the pain, too. Already, I’ve had loved ones tell me to be positive and to focus on the gratitude — and, dear hearts, if you’re reading this, I love you and thank you for your kindness — but that is not what I need right now. Should I be optimistic? I guess I am, in that I didn’t think twice about whether to have the treatments or not. Definitely, any optimism I have is grounded in reality: this will not be fun. It might not even work. It might happen in the other eye. But, together with my skilled doctor, I’ll do my best to work toward a positive outcome. I’ve been thinking about the words of Admiral James Stockdale, the highest ranking naval officer to be held prisoner during the Vietnam War. He observed that the POWs most likely to survive that experience were those with reality-based optimism. Neither the prisoners who thought they would be released almost immediately nor the POWs who believed they would never be released survived as well. Stockdale said, “You must never confuse faith that you will prevail in the end – which you cannot afford to lose – with the discipline to confront the most brutal facts of your current reality, whatever they may be.” So be it. Faith, yes. And, tell me the truth. I’ve also been thinking about a cautionary note in the book Happiness: Unlocking the Mysteries of Psychological Wealth by father and son positive psychology team Ed Diener and Robert Biswas-Diener. Although happier people are in general less likely to have ill health, the Dieners warned, when it comes to surviving physical maladies, happier people can fare worse. Because their glasses are too rosy, perhaps? Or their optimism isn’t reality based? So I don’t want that “happy person” who is disconnected from her own health reality. That means not only doing what I need to do, but also feeling what I need to feel. With the support of a few loved ones, I’m giving myself some hibernation time — no church choir for me this weekend. I want to grieve, for the human condition, bodies that break, and my lost eyesight. I’m also aware of my anger directed at the optometrist who didn’t find any symptoms back in March, at myself for not going to see a retinal specialist earlier, and at the world in general because no one ever told me that such a thing might happen to those of us near-sighted folks with large eyeballs. I will forgive the optometrist. I will forgive myself. Not yet, though. Here’s another aspect of my teaching that now seems a little too close to home: I always read Helen Keller’s essay “Three Days to See” to my meditation classes because it does such a good job of illustrating the value of mindfulness. Keller wrote compellingly of all the amazing wonders of the world we would see so much better if we were faced with the loss of our eyesight. Hopefully, I am not facing the loss of my eyesight. Still, on the ride home from the doctor, while my loving husband drove, I reflected on Helen Keller’s words and tried to savor the picture postcard Vermont summer mountains and sunny blue skies. I couldn’t do it. I just needed to be sad. It’s dark, rainy and cold today. Later this week, sunny skies and seasonable temperatures are expected to return. Perhaps my own good cheer will re-emerge in a few days as well. Maybe not. Either way is okay. Shore to shore, door to door. Think of the valleys, the mountaintops, the Earth never stops. 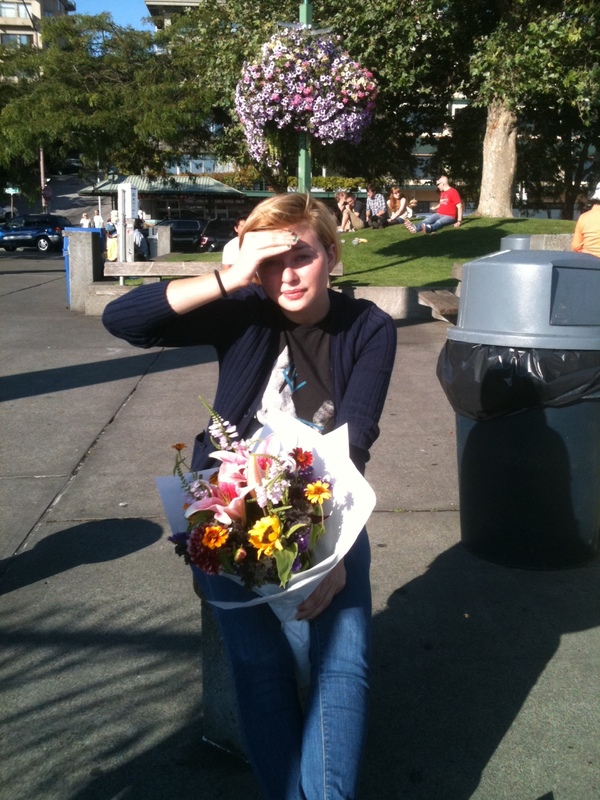 Flowers with a friend at Pike Place market in Seattle. In the film, the pie was about sharing small town life with — you guessed it — a loveable but lonely dragon. In Seattle, at the conference sponsored by the Happiness Initiative last weekend, the “pie” was a great deal bigger: the happiness movement itself. Indeed, “big” scarcely scratches the surface of describing our efforts to shift the dominant cultural paradigm away from the environment-destroying GDP definition of success and toward a life-enhancing Gross National Happiness metric instead. There’s definitely room for everyone in this movement! And just what will everyone do? Heeding the wisdom of Martin Seligman, I suggest we each tap into our personal strengths and do whatever it is we each do best. The diversity of speakers at the conference’s plenary session — from renowned ecological economist Robert Costanza to representatives from the Compassionate Action Network and the hardworking staff of the Happiness Initiative — collectively demonstrated that there are probably an infinite number of doorways into this work. Why not pick the path that plays to our strengths? Justin, a young Japanese-American musician specializing in Brazilian music in New York City. Justin is new to the movement, and looking for his particular doorway to participation. So which doorway should Justin, or any of the rest of us, take? Though it isn’t necessarily easy to know what we’re best at and where we fit in, I think it’s worth the soul searching it may take to find the answer(s). Those of us in the happiness movement should walk the talk as best we can. In The How of Happiness, Sonja Lyubomirsky stresses the need to find the best individual fit for happiness increasing activities. Similarly, we should find the best fit for our individual roles within the happiness movement. The next question is, how? Once again, happiness research offers the answer: mindfulness. “To lead a happy life, we need to make good decisions,” write father and son happiness researchers Ed Diener and Robert Biswas-Diener. “Making good choices in life depends on recognizing not just rewards but the likely problems in choices as well.” Mindfulness helps us cultivate the wisdom and awareness to make appropriate choices. The Dieners remind us that happiness is a process, not a destination. Certainly, it has been a process to find my own niche within the happiness movement. I was fortunate to be in the right place and time to serve as one of the founders and co-coordinators of GNHUSA, yet eventually felt the tug to step away from that group to follow my own creative passions. My process ultimately led to birthing the Happiness Paradigm, which continues to evolve through choices that feel are in closer alignment with my talents and passions. Now, with greater mindfulness, I’ve returned to work with GNHUSA again on various projects — including, in October, joining fellow co-founders Linda Wheatley and Paula Francis for a few days on their “Pursuit of Happiness Walk”from Stowe, Vermont to Washington, D.C. Sometimes the journey is both literal and metaphorical! The benefit of finding and sharing our strengths was very clear on day two of the Seattle conference, when Scott Crabtree, Steve Poland, and I had the honor of co-presenting a workshop on personal happiness. Scott — a young, polished, and engaging businessman — went first, with a high energy, professional presentation. Next up was Steve, a deeply thoughtful psychologist and academic who brought a teacher’s care and concern to the group. Finally, I shared my artistic (perhaps quirky?) individualized approach to spreading personal happiness. This combination seemed to be well received by the 30 or so people in attendance. Throughout the conference, there were many references to, and practices of, gratitude. Indeed, those of us who are already activists in the movement are very blessed to cultivate a deep internal happiness while giving our best in service of greater well being worldwide. We have much to be grateful for. Those of you not yet actively on board, please know that you — the real you, the authentic you — are welcome to join us in this work. We’ll be grateful to receive your gifts.